A cheap, household supply item is used to defeat advanced theft prevention systems every day. Retailers attribute millions of dollars in stolen goods to the use of 'booster bags', a simple exploit used to defeat retailer's EAS systems. In this note, we examine a new product designed to overcome the weaknesses of standard EAS and aid the effort to stamp out booster bag theft. Most EAS systems are designed to detect the presence of alarm tags on merchandise. When merchandise is purchased legitimately, these tags are either deactivated or removed so they do not 'alarm' the EAS system as the merchandise leaves the store. However, stolen merchandise that does not properly pass thru the checkout stand is detected by alarming EAS pedestals, immediately drawing attention to the activity. To summarize the problem, booster bags create a simple 'faraday cage' that blocks even the most sensitive EAS tags, due to the low power or passive detection method they typically employ. To combat the problem, many retailers are being forced to find enhancements for their current EAS systems. In the section below, we examine one of those solutions and analyze its application. 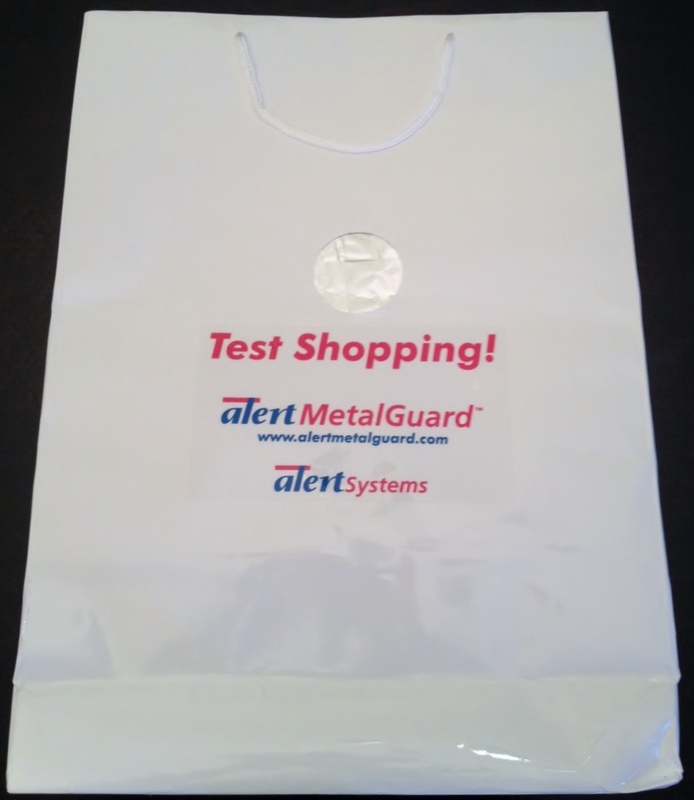 At the recent NRF-LP show, a company named Alert MetalGuard was displaying their 'anti-booster bag' detection sensors. Interestingly, instead of handing out pencils, pens, and other trade-show trinkets, the company was handing out promotional booster bags and challenged attendees to 'try out the technology'. A very simple, yet very compelling demonstration showed how the company's sensor pedestals detected and alerted on the presence of a booster bag. The 'MetalGuard' product is designed to detect the presence of non-ferrous, metallic objects. Detection Ranges span from 4.5' to just under 9.5', covering most retail openings. Alarm system 'stands alone' from existing EAS system, but can be configured to alert to companion pagers or alarm system/video surveillance system contacts. 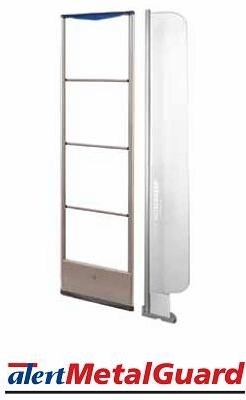 System can be configured for use on revolving doors and rolling gates. This system alarms on materials like aluminum, titanium, and other non-iron alloys. While those materials are commonly used in a number of different types of product, they typically are not used in such a significant quantity to approximate the density of a booster bag. The manufacturer claims MetalGuard sensors do not 'false' alarm on common aluminum items like shopping carts or baby strollers, because those items do not posses sufficient metallic density to be confused with a booster bag. The system is an 'add-on', meaning it does not perform the function of the EAS system and is an additional system. MetalGuard only detects the presence of booster bags as an indication of potential criminal activity, it does not replace or overlap a retailer's EAS system. The manufacturer of MetalGuard has not expressed any plans to develop EAS at the current time. While the system can be manually integrated into other alarm systems by way of relay contacts, remote notification of alerts take place through proprietary 'AlertQuickPager' devices that must be purchased and carried separately. Asking LP personnel or Store Managers to each carry another handheld device could be seen as a cumbersome and expensive measure.